Wharf Studios consist of a ground, lower ground and basement commercial units in a new residential development. Thirdways Interiors were contracted to carry out elements of a Cat A fit out including new metal raised floors, painted walls with exposed concrete columns, exposed MEP services, new toilet facilities and contemporary lighting. To provide and enable travel between the multiple floors Thirdways Interiors needed a platform lift solution. Platform lifts were required to provide disability access to the entrance of each of the seven units. Furthermore, additional provisions for access needed to be achieved inside the units due to the different levels. Tenants needed to be able to easily traverse between the multiple floors. 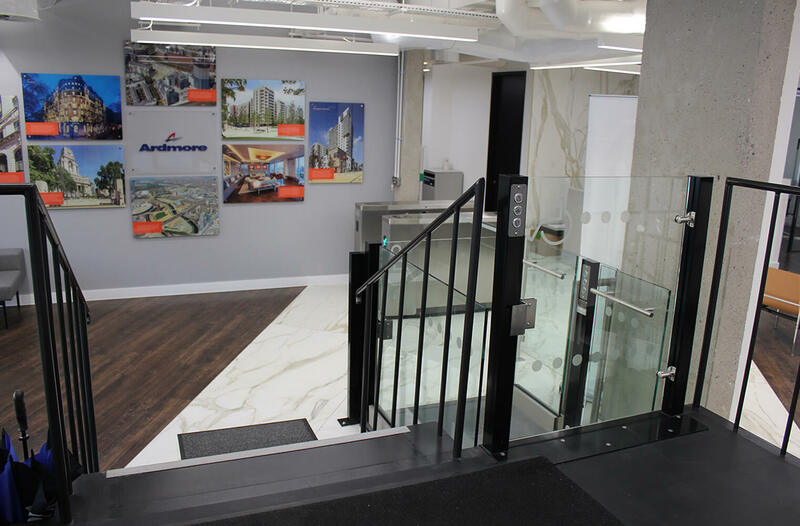 Thirdways Interiors appointed the Platform Lift Company to come up with an unobtrusive design solution which would blend in with the modern office interior and mirror its sophisticated up-market appearance. The senior project designer also required that the lifts were glazed and that they complimented other architectural features including the spiral staircase design. The Platform Lift Company used its in-house design expertise to come up with two different types of lifts to accommodate the different levels of height. To overcome the 650mm height difference from the entrance down to the ground floor level it was suggested that a scissor lift would provide the best solution. 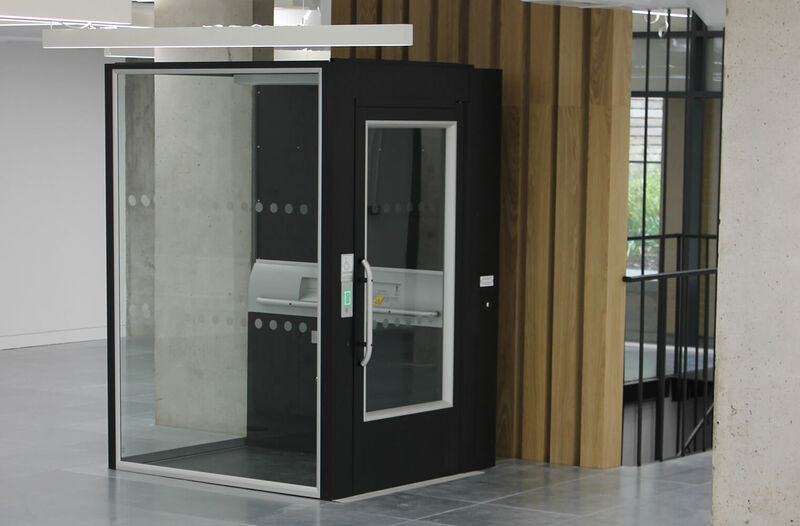 To reach the different levels within the units the Platform Lift Company recommended its Swedish Style lift which comes with its own fire rated lift shaft. Thirdways Interiors were presented with the design concept of using a black finish with stainless steel and glass for both types of lifts. Happy that the lifts would remain in keeping with the modern environment and reflect the new design of the offices, the Platform Lift Company were given the go ahead to build seven scissor lifts and seven Swedish Style lifts complete with glazed shafts. The installation process was handled with supreme care and precision. Each lift was installed using a ramp system instead of a pit to avoid any structural changes or having to dig down. The final results met the brief, the scissor lifts with their black and stainless steel finish with glass panels have remained in keeping with the balustrading at the entrance of the office building. 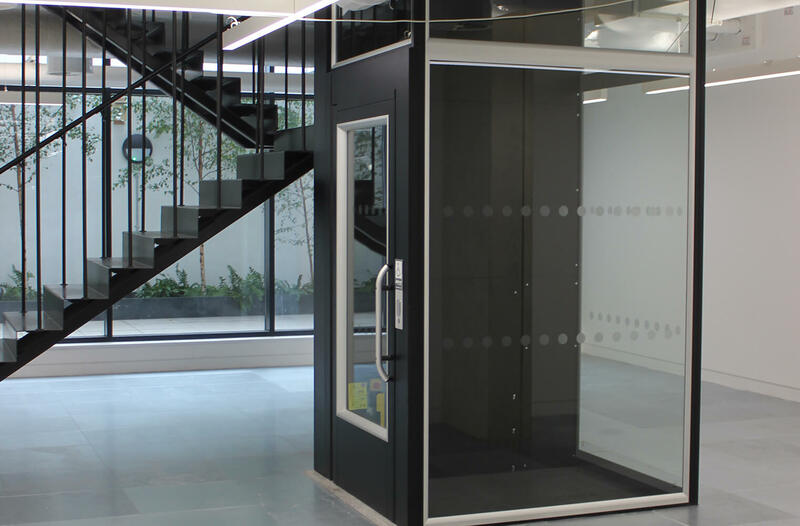 Equally, the platform lifts finished in black with stainless steel match the ultra-modern interior design of the office units and the glass shafts create a seamless finish. 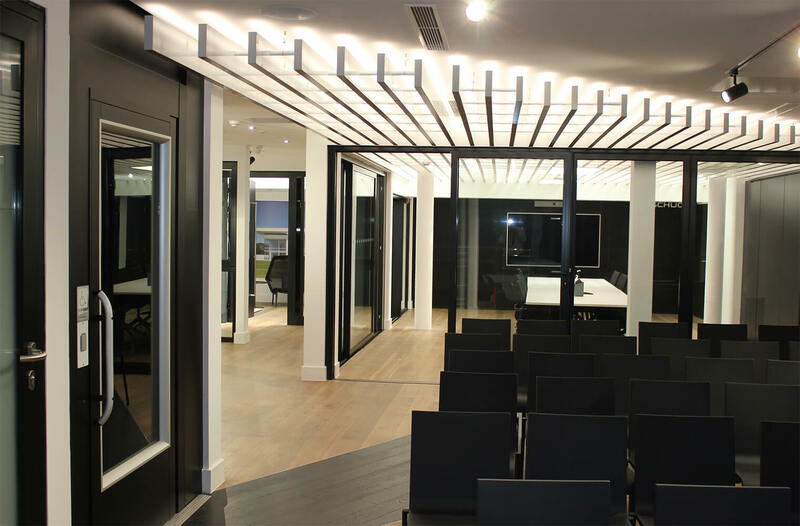 The self-contained office units complete with private terraces are now complete and are being advertised as modern, industrial style working spaces which are DDA compliant.